BuchuLife Herbal Water - a refreshing sugar-free beverage, boasting naturally occurring antioxidants, bioflavonoids and vitamins sourced from the oil of the Buchu leaf, a scientifically proven natural anti-inflammatory and endemic specie to the Cape Floral Kingdom. 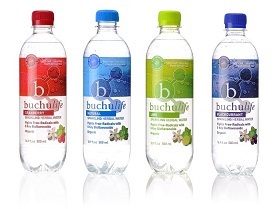 An innovative alternative to hydration, BuchuLife Herbal Water promotes a healthy lifestyle wherever you go! BuchuLife Herbal Water is a refreshing tonic which contains the essential vitamins and antioxidants needed by the body to combat free-radicals and enhance general wellbeing. Our scientifically formulated Buchu Oil contains the potent antioxidants quercitin, rutin, hesperidin, diosmin (bioflavonoids), diosphenol and Vitamins A, B and E.
BuchuLife Herbal Water has been developed in South Africa by Cape Kingdom Nutraceuticals (Pty) Ltd. The benefits of the formulated Buchu extract used in Buchulife products have been scientifically researched by Professor Patrick Bouic, Head of Immunology at Stellenbosch University and Tygerberg Academic Hospital. The Buchu herb used to create BuchuLife Herbal Water is indigenous to the Western Cape Province of South Africa and forms part of Fynbos, the vegetation type unique to the Cape Floral Kingdom - a World Heritage Site.